We recently have had a flurry of inquiries as to what these missing coin-slides and interior coin-catchers look like, the latest being yesterdays thread by Mathew Caulfield on behalf of Don Naples. As for the "coin-catcher" mounted within the music box cabinet, several different styles were made for the variety of models. 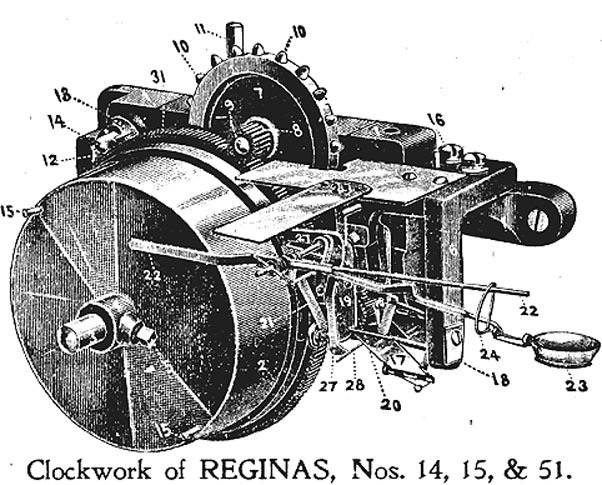 I'm attaching copies of a few original Regina parts and maintenance diagrams that we have on file here. These "coin-catchers" were originally termed "Shovel" attachments. They are a Rube Goldberg-ish looking device that is quite difficult to describe if you've never seen one. In operation, once the coin drops clear of the case mounted coin slide, it drops into the shovel (a concave, open bottomed cup). 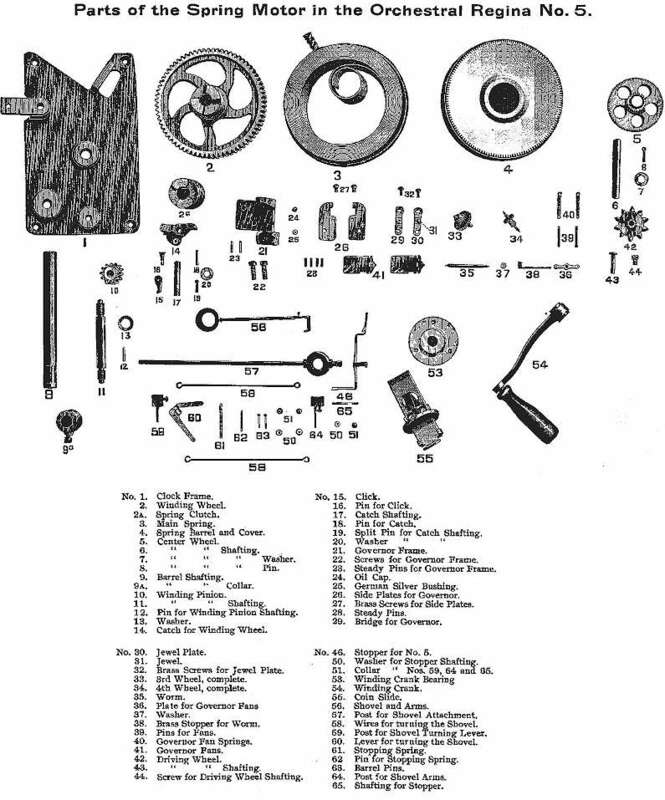 The weight of the coin depresses the spring loaded shovel and arms (part 56) and in turn actuates the governor stop/start control lever (part 46), clearing the governor and allowing the motor to start. As the mainspring barrel rotates, you will find either 1 or 2 studs protruding from near the barrel rim. These studs dictate either 1 or 2 plays for the coin (dependant upon model and operators choice). The stud would engage part #59 (post for shovel turning lever), pulling the wire linkage (part 58), attached to the small wire eyelet (right, upper side of part 56). This upward motion would partially rotate (about 90 degrees) the coin shovel, thus 'dumping' the coin. Without the weight of the coins, the whole shovel and arms 'rig' (56) returns to its level position, clearing any tension upon the governor stop/start lever (46), so that it may stop automatically at the end of play. Now if you could follow any of that, God Bless and Good Luck! My advice to anyone attempting to remake one of these contraptions, is to locate another friendly collector with a similar example to look at before hand! In the meantime, maybe one of these original diagrams may help understanding what all is missing. Read Jere's description of the replica Regina coin slides elsewhere in 030123 MMDigest.